In May 2009, President Barack Obama vowed to provide transparency and accountability by tracking stimulus money allocated under the American Recovery and Reinvestment Act of 2009 (ARRA). The goal was to provide taxpayers with the ability to track money in their community, all the way to street level. Recovery.gov was launched to provide detailed information on projects and report on how stimulus money is being spent. In addition, each agency began to publish reports on their own websites for allocated funds. In addition to funding reports, the U.S. Department of Agriculture (USDA) created an interactive geospatial map using Google Maps API Premier allowing the public to generate customized views for tracking funds. This map was made available to the public in early May and has received nearly one million hits to date. Today, the interactive map provides data for five programs within USDA and is continuously adding other agencies within the department as the funds get allocated and data becomes available. 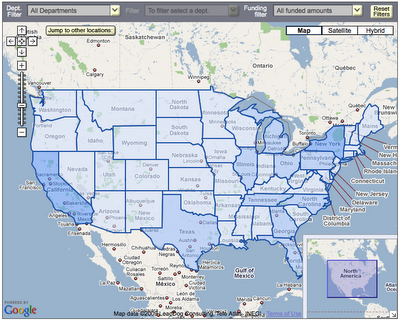 Citizens can search and drill down to see funding allocations per department, program and location. To support the map feature, we established blogs for each state to share detailed information and updates about projects underway. Communities are encouraged to share their stories through this feature as well. In July the Department of Housing and Urban Development joined the effort, followed by the Department of Commerce in August, allowing the public to search for and track a larger set of projects. The Department of Defense and other federal departments will be added to this site in the near future. Check out the USDA AARA Project Map for yourself and learn more about the map, including detailed instructions for how to use the map.